It is becoming more evident that many children are lacking the opportunity to be fit and healthy. Schools offer some activity as part of their compulsory curriculum; however, it does not cover the government activity guidelines for children needing to accumulate 60 minutes of moderate activity on a daily basis. Health professionals are expressing concern for the future health of today’s kids, fearing that they may suffer long term consequences as a result of their sedentary lifestyles. Many kids today are considered obese, and weight loss programmes for children are gaining in popularity. It is important that parents take their children’s health and fitness seriously because habits formed in childhood are often maintained all throughout life. With childhood obesity rates increasing and physical fitness classes decreasing, many parents are turning to personal trainers not only for themselves, but also for their kids. Statistics from the most recent large-scale survey in the UK shockingly reveal that 25% of boys and 33% of girls aged between two and 19 years are overweight or obese. It's not surprising that parents are seeking new ways to combat the growing trend. Why use Kross Training Kids? Kross Training Kids is a great way to learn healthy behaviors that will last a lifetime. It's also a great way for an overweight child to get some immediate results and reinforce the benefits of fitness. Given that childhood obesity predicts adult obesity with amazing accuracy, parents are wise to encourage healthy habits early. Kross Training Kids will provide direction, structure, and strategies that help create a habit of healthy living that can have a tremendous impact in a child's life. Another reason to hire Kross Training Kids is to improve sports performance and sports skill training. According to the American Academy of Pediatrics, kids as young as 8 years old can benefit from low-resistance exercise with small weights and actually grow stronger with little risk of injury. Is Kross Training Kids right for Your Child? Why Kross Training Kids is best for your child? Training offers a balanced routine of strength, cardio and core exercise. Kross Training Kids will help the child find activities he/she enjoys and will do on his/her own. 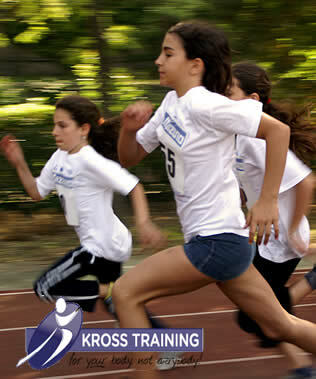 Kross Training Kids will educate about the benefits of physical activity. Patience and encouragement from parents will be required for your child to get the most of the sessions. To improve motor skills, speed, and co-ordination, children need to work with a trainer once or twice a week for three to four months before they develop a habit of exercise and be motivated to stay active on their own. For kids to develop a new lifestyle takes time and the goals of you, your child and the personal trainer need to be realistic and modest.